Nearly a week after they were suddenly suspended from their duties, B.C. 's legislative assembly clerk and sergeant-at-arms said they still have no idea why they're being investigated by the RCMP. 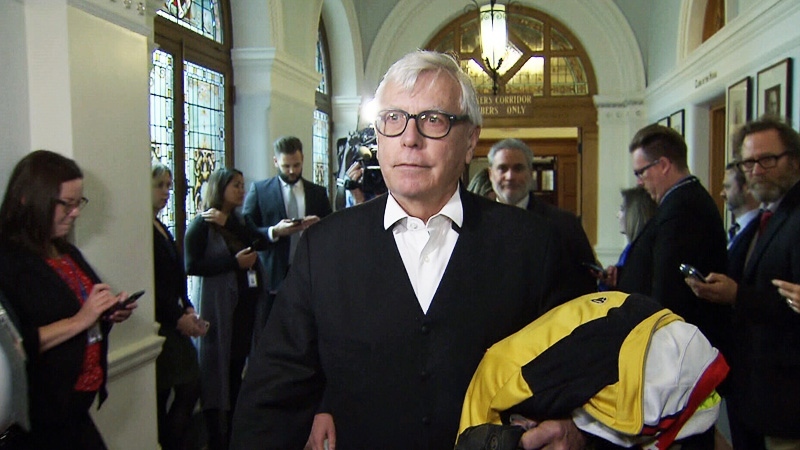 "Although it is impossible to deny what you do not know, I firmly say that I have done nothing wrong and that I am confident that an independent investigation now underway with the RCMP will clear me of any alleged wrongdoing," Sergeant-at-arms Gary Lenz told reporters Monday. Solicitor General Mike Farnworth put forward a motion Tuesday that he and Clerk of the House Craig James be placed on administrative leave. Both were escorted out of the building, James by a Victoria police officer. James said he "cannot imagine what concern there is about how I have acted in the administration of the Legislative Assembly which would warrant my being removed from my office. "I am left in the position of not being able to respond because no one has told me what the allegations are or asked for my side of the story," he added. On Wednesday, Special Advisor to Speaker Darryl Plecas, Alan Mullen, confirmed the allegations against the clerk and sergeant-at-arms date back until at least January. In a scathing letter sent to house leaders on Friday, however, James and Lenz's lawyers said "the Speaker has no constitutional authority to carry out an investigation of the Clerk of the Legislative Assembly or the Sergeant-at Arms" and no authority to hire advisers to do so. Attorneys at Fasken Martineau DuMoulin called for their clients to be placed back on active duty, citing an "absence of cogent facts" to prove that they can't do their jobs while the investigation is ongoing. "Unless there is something specific in the facts allegedly brought to light in this case that makes it impossible for Mr. James or Mr. Lenz to carry out their duties, the only way that the injustice now unfolding from the passage of the motion can be mitigated pending the outcome of the investigation, and public confidence restored, is for the motion to be rescinded," the letter read. James and Lenz renewed those calls Monday. "There are processes in place to investigate permanent officers such as the sergeant and the clerk," Lenz said. "I respectfully ask that MLAs consider rescinding the motion and reinstate me and my colleague…Craig James to our position pending the outcome of any investigation currently underway." James, who became clerk in 2011, described himself as "a practical person" who would have no difficulty going back to work with Speaker Darryl Plecas or any of those who voted in favour of the suspension. "I hold no bitterness towards anyone involved in this process," he said. "I consider the members to be friends and colleagues, and I have enjoyed strong relationships over the more than 30 years I have worked in the legislature." Solicitor General Mike Farnworth wouldn't give any specifics Monday, saying only that "I understand their comments and I understand their frustration." B.C. 's attorney general even encouraged those in the legislature to refrain from discussing the investigation. "I would urge all members in this place to refrain from commenting on the events of the past week until the investigation is complete," David Eby said. Plecas then lashed out at journalists covering the shakeup. "I think what you people need to do is understand when you talk about investigations, it's a huge continuum and one of those is called due diligence and I'm thinking you might want to do some of your own," he said. The Liberals are now actively trying to take down the man who left their party to become Speaker. 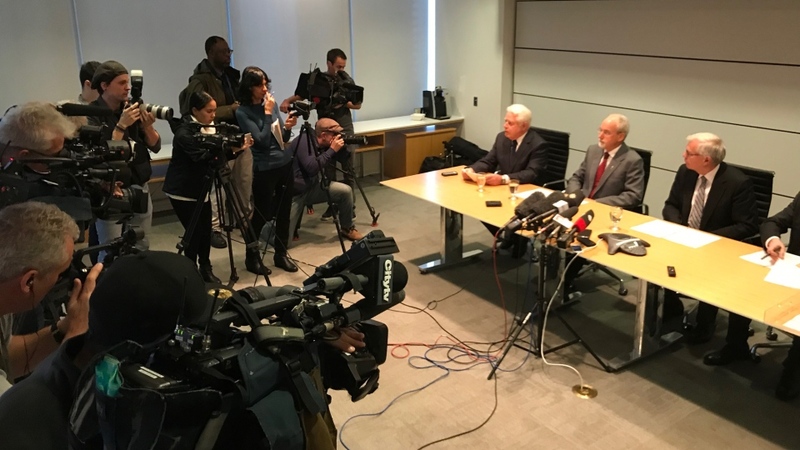 "We all need to be concerned that he's building his own little empire, staffed with expensive lawyers, with investigators with no credentials," Liberal Leader Andrew Wilkinson told CTV. Plecas had already come under fire from the Liberals, his former party, who claimed the Speaker recently suggested Mullen himself serve as interim sergeant-at-arms. Opposition house leader Mary Polak said the decision to suspend James and Lenz was discussed was at a meeting Monday night between her, Plecas, a lawyer and the NDP and Green house leaders. An affidavit signed by Polak says Plecas "stated his wish" that Mullen be appointed acting sergeant-at-arms, an interim position. Speaking to reporters Thursday morning, Polak called the suggestion "not appropriate." Hours after the allegation was made, Mullen announced Plecas had hired former attorney general Wally Oppal as a second adviser in the case. Friday's letter also prompted the Liberals to release a list of 11 questions the party said need to be answered urgently later that day, including "Was the Ministry of the Attorney General aware of the lawyer advising the Speaker, and did the Ministry agree to the retainer of that lawyer?" Clerk of the House Craig James and Sergeant-at-Arms Gary Lenz speak to reporters on Monday, Nov. 26, 2018.